*We are looking for people to donate cases of soda (any and all varieties, regular and diet) for the banquet. You can drop them off or send them in with your wrestler any day or time and we will be storing them until the banquet! Thanks in advance for your help! *Reminder: please get your payment in for the SCWAY card ($17.50) and the banquet. Both checks made out to CVHS wrestling booster. *I just put some posts in the que for the next few days that contains some pretty interesting videos and links. Be sure to check them out when the posts come up! 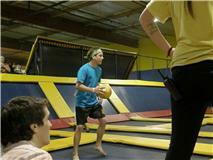 The Sky High Dodgeball tournament was an absolute blast! 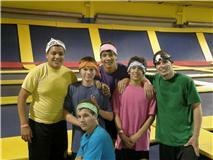 Christian Hauser, Shane Johnston, Michael Davis, Jericho Uribe, Max Adam, and Jason Hou represented Capo at the Sky High trampoline dodgeball tournament. They took out some mighty tough teams before falling to the top seeded team in later rounds. Good job, fellas, and glad you had a blast. The dealio is for you guys to do stuff like this on your own a lot. Hey, grab a group, go see a movie, go bowling, go to Sky High on Friday nights…do anything. The point is that it be clean, be fun, and that you do it together. Christian Hauser and Juan Hernandez will be representing Capo this weekend at the SCWAY F/So/Jr. state meet in Lemoore. Zane Coley will also be representing Capo at the USA wrestling F/So state. That’s the ticket: gettin’ after it in the off season and searching out good competition so you can get better. Spring/summer training makes winter champions. Good luck fellas!